But good landscape design work goes even farther than that. It also ensures the space can be utilized to its fullest with everything functioning the way it should. A landscape design makes sure all the elements of the project interact well together. That includes not only the right blend of plant materials but also that all your hardscape materials will work well together. Design takes all sorts of factors into account including views (ensuring nothing is blocking the views you want), layout (such as the foot traffic flow), and even long-term aesthetics (what will that plant material look like 5 years from now?). 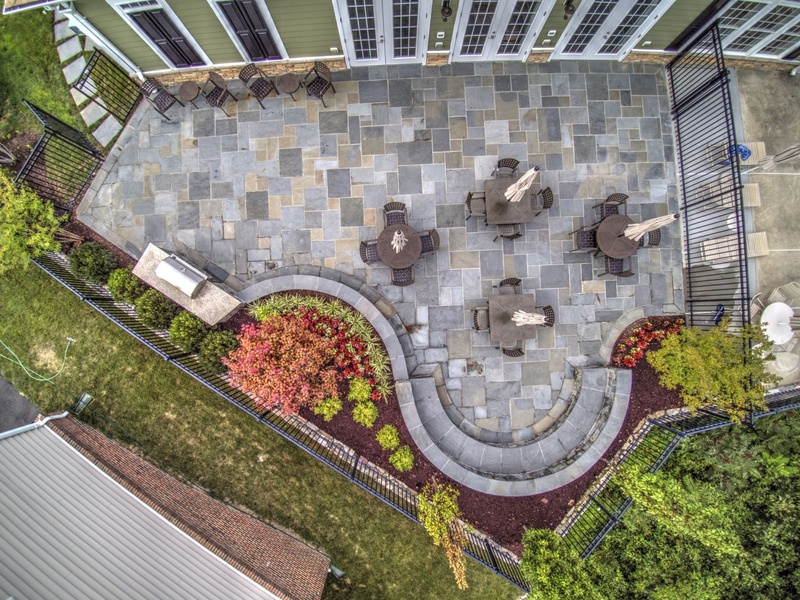 Having a landscape design for your Ashburn, Aldie, or Leesburg, VA project will also ensure that every possible consideration is taken into account before you start building. For instance, a good landscape company will make sure that they plant a Maple tree the proper distance from your home so that down the road, roots aren’t growing under- and tearing up- your natural stone patio. They will also give thoughtful consideration into what plant material will look best in your project. Smart design will not just look at how it will appear in the spring- when everything is blooming- but will look ahead to see what it will look like the rest of the year, for multi-season interest. In addition to working closely with you on wants and needs, the landscape design process also allows a landscape contractor to break your project out in stages if your budget won’t allow you to complete it all at once. You can phase a project out in two or three stages in such a way that you are the only one that knows it is incomplete. To everyone else it will look like a finished project - not realizing there is more to come. But the best way to phase a project is to have a landscape design that includes future stages. All of these important factors can be considered with a professional landscape design. As you start the process with Rock Water Farm, you can expect your landscape designer to lead you through the following three phases. During the initial consultation you can expect that we will discuss some of your thoughts and ideas for your project, possibly discussing a ballpark idea of your budget (though we’ll get much more in depth with that during phase two). 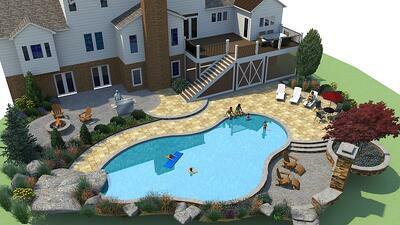 It’s these ideas that will go into the preliminary landscape design for your Ashburn, Aldie, or Leesburg, VA home. It can be helpful to share photos that you’ve saved of projects you like. We can also show you projects we’ve done to help narrow down what it is you’re looking to achieve. While it is sometimes overlooked, having all the decision makers in the household present during the initial consultation is incredibly important. As we discuss ideas and devise an initial plan, it is vital that everyone is on the same page. In the past we’ve found that times when we have met with just one of the decision makers of the household and come back with a design, it has been rejected by the decision maker that was not initially present. Sending us back to the drawing board is a waste of your time and we’ve found it much more prudent to have everyone available together. Another important initial consideration is your timeline. Bear in mind that many of the sought-after landscape companies do have a backlog of a month or more so understand that planning a design and moving forward with executing it will take some time. But doing things the right way and not rushing through the process is important to ensure that you’re getting what you truly want out of your investment. If you’re serious about having a landscape project completed, don’t hesitate to get the ball rolling on the process. After we have completed the conceptual design, you should expect a follow-up meeting to discuss it. During this meeting, we’ll explain some of the reasons behind the landscape design for your Ashburn, Aldie, or Leesburg, VA home. Everything has a place for a reason in a landscape design. A lot of thought goes into not only how the finished product will look - but also how it will function. During the follow-up meeting, we’ll have some important questions for you about your landscape design, going through it item by item and finding out what you like and what you might change. This is the time to really hone in on specifics and to work out design elements that you want to see in the finished product. This follow-up appointment is when we’ll really start to discuss budget in more depth, giving you an approximate cost for your ideas. With a landscape design, we can also plan your project in phases so that even if your budget doesn’t allow it all to happen at once, we can plan for the future (which happens during the next and final phase). By now we’ve narrowed down exactly what it is that you want. During this final phase, we’ll sit down with you to discuss the finalized landscape design for your Ashburn, Aldie, or Leesburg, VA home. At this stage we will have fine tuned everything and have true costs available. We’ll talk hard numbers and what your budget will allow. If there’s more you want to do than you can afford at once, we can break your project into stages in which we can plan to complete it in two or three different phases. At Rock Water Farm, we don’t charge for design work (except for cases where it’s incredibly in-depth) but we do retain the design. If you’re interested in moving forward, this is the time when we will take a deposit and enter into a contractual agreement. After that is complete, we will give you a copy of the design for your records. 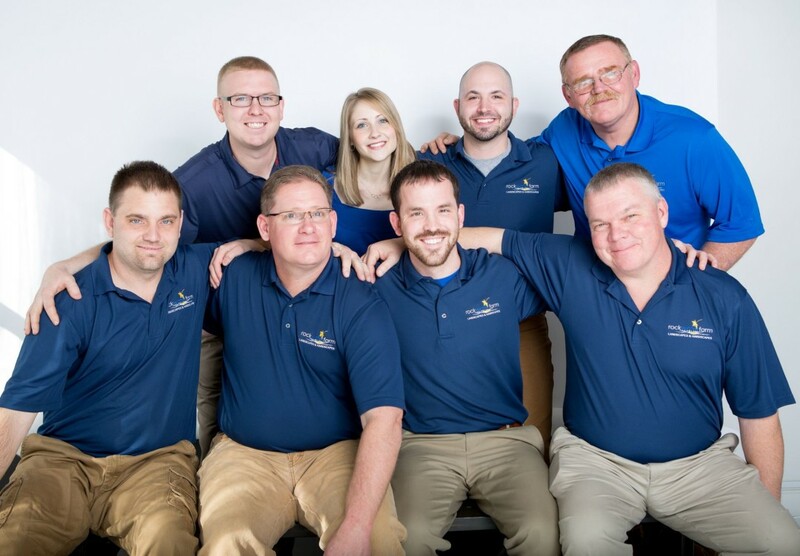 Our approach ensures that serious homeowners like yourself, are given the time and attention they deserve by our team. It's our goal use your time wisely, and we have many years of experience of doing this with thousands of homeowners in Ashburn, Aldie, Leesburg, Haymarket and other surrounding areas in Northern Virginia. 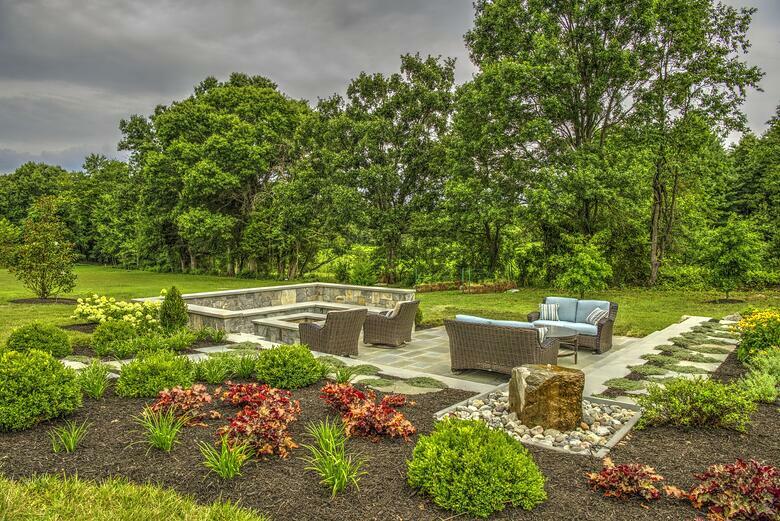 At Rock Water Farm we do not perform design-only work like some other landscaping companies. We spend a lot of time on our professional landscape designs and complete them knowing that we will be building the project ourselves. By the third phase of our design process, we’ve come to know you and your project and will be able to complete it the way you truly want. As ideas that you’ve likely dreamed about for a long time start coming to life in a landscape design, there are a lot of reasons to start getting excited. 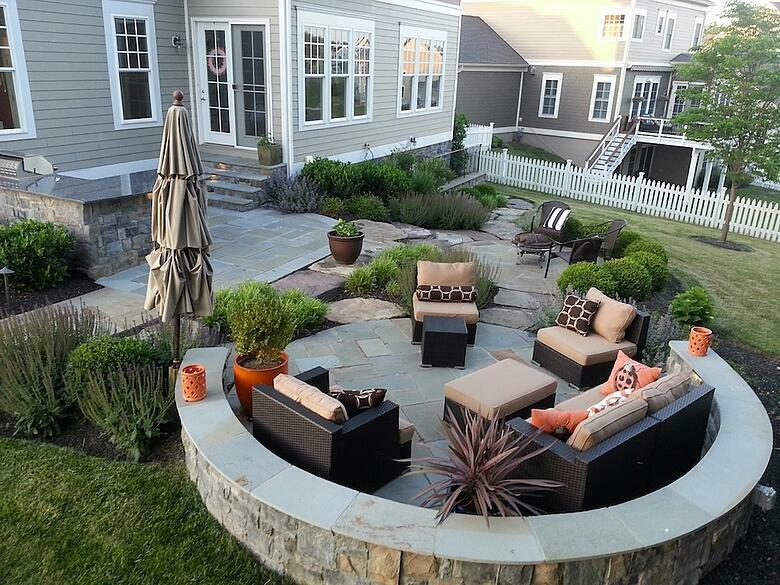 After all, the landscape design process means that your backyard project is truly underway. We will guide you through each step of the process, ensuring that those ideas you’ve long dreamed about are in fact coming to life in the way you’ve always wanted. Plus, because we’re thinking through all aspects of the project, we’ll also make sure things you didn’t even think of are taken care of properly. The finished project will not only be aesthetically beautiful but will be function well, too. In other words, it will be everything you’ve dreamed of- and more. We invite you to get started with the landscape design process for your Ashburn, Aldie, Leesburg, or Haymarket, VA home. You can schedule a free consultation or call us at 703-327-1636.